World population is increasing at an alarming rate and this has resulted in increasing tremendously the demand for tree products such as wood for construction materials, fuel and paper, fruits, oils and medicines etc. This has put immense pressure on the world?s supplies of trees and raw material to industry and will continue to do so as long as human population continues to grow. Also, the quality of human diet, especially nutritional components, is adversely affected due to limited genetic improvement of most of fruit trees. Thus there is an immediate need to increase productivity of trees. Improvement has been made through conventional breeding methods, however, conventional breeding is very slow due to long life cycle of trees. A basic strategy in tree improvement is to capture genetic gain through clonal propagation. Clonal propagation via organogenesis is being used for the production of selected elite individual trees. However, the methods are labour intensive, costly, and produce low volumes. Genetic gain can now be captured through somatic embryogenesis. Formation of embryos from somatic cells by a process resembling zygotic embryogenesis is one of the most important features of plants. In 1958, Reinert in Germany and Steward in USA independently reported somatic embryogenesis in carrot cultures. 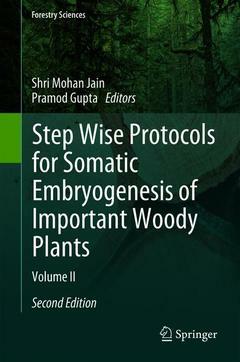 Since then, tremendous progress in somatic embryogenesis of woody and non-woody plants has taken place. It offers a potentially large-scale propagation system for superior clones. Section A: 1. Slash pine (Pinus elliottii Engelm. ), R.J. Newton, et al. 2. Somatic embryogenesis and genetic transformation in Pinus radiate, C. Walters, J.I. Find. 3. Douglas–fir (Pseudotsuga menziesii), P.K. Gupta, D. Holmstrom. 4. Omorika spruce (Picea omorika), S. Mihaljevic, S. Jelaska. 5. Somatic embryogenesis in Picea glauca, E.C. Young, T.A. Thorpe. 6. Protocol of somatic embryogenesis: Black spruce (Picea mariana (Mills.)B.S.P. ), F.M. Tremblay, et al. 7. Sitka spruce (Picea sitchensis), D. Thompson, F. Harrington. 8. Protocol of somatic embryogenesis of Pinus nigra Arn, T. Salajova, et al. 9. Loblolly pine (Pinus taeda), W. Tang, R.J. Newton. 10. Somatic embryogenesis in maritime pine (Pinus pinaster Ait.) L. Harvengt. 11. Somatic embryogenesis in Pinus patula, C.S. Ford, et al. 12. Somatic embryogenesis in Norway spruce, M. Vagner, et al. Section B: 13. Cashew (Anacardium occidentale L.), R.S. Nadgauda, S.S. Gogate. 14. Somatic embryogenesis protocol: coffee (Coffea arabica L. and C. canephora P.), H. Etienne. 15. Protocols for somatic embryogenesis and plantlet formation from three explants in tea (Camellia sinensis (l.) o. kuntze), A. Akula, C. Akula. 16. Protocol of somatic embryogenesis from Citrus spp. anther culture, M.A. Germana. 17. Integration system for propagation of Theobroma cacao L., S.N. Maximova, et al. 18. Mango (Mangifera indica L.), H. Ara, et al. 19. Somatic embryogenesis in jackfruit (Artocarpus heterophyllus Lam. ), S.K. Roy, R.K. Debnath. 20. Somatic embryogenesis in Indian olive (Elaeocarpus robustus L.), S.K. Roy, P. Sinha. 21. Rescue of endangered palms by in vitro methods: the case of ‘bottle palm’, V. Sarasan, et al. 22. Somatic embryogenesis in American grapes (Vitis x labruscana L.H. Bailey), S. Motoike, et al. 23. Pistachio, Pistachio vera L., A. Onay. 24. Grape (Vitis vinifera L.), D.K. Das, et al. 25. Date palm, Phoenix dactylifera L., J.M. Al-Khayri. 26. Somatic embryogenesis protocol: Citrus, F. Carimi.27. Olive (Olea europaea), M. Mencuccini, et al. Section C: 28. Protocol of somatic embryogenesis: Dalbergia sissoo Roxb. (Sissoo), A.K. Singh, S. Chand. 29. Protocol of somatic embryogenesis: Pedunculate oak (Quercus robur L.) and sessile oak (Quercus petraea /Matt./Liebl. ), V. Chalupa. 30. Protocol of somatic embryogenesis: tamarillo (Cyphomandra betacea (Cav.) Sendtn. ), J.M. Canhoto, et al. 31. Protocol of somatic embryogenesis: European chestnut (Castanea sativa Mill. ), U. Sauer, E. Wilhelm. 32. Protocol of somatic embryogenesis in Acacia arabica (Lamk.) Willd., G.R. Rout, R.M. Nanda. 33. Protocol for hazelnut somatic embryogenesis, B. Berros, et al. 34. Protocol of somatic embryogenesis: Ocotea catharinensis Mez. (Lauraceae), A.M. Viana, et al. Prof. Dr. Shri Mohan Jain is an Indian-born plant biotechnology scientist. He worked several years for the International Atomic Energy Agency in Vienna. He has done research on genetically modified food, mutation breeding, ornamental plants, date palm, and tropical fruits, such as banana. Prof. Jain completed his bachelor's degree at the Chaudhary Charan Singh Haryana Agricultural University in Hisar, Haryana, India (1966–1970). After that he continued his studies to receive a Master of Science from the Genetics department at the G.B. Pant University of Agriculture and Technology in Pantnagar, Nainital, India (1970–1972). In 1972 he started his studies in Master of Philosophy in Jawaharlal Nehru University in New Delhi, India and finally completed his studies with a PhD from the same university in 1978. Pramod Gupta has been involved in the science of tree cloning since he chose forestry as his career at the age of 20. He has a PhD and 30-years of work experience with one of the global leaders in forestry, Weyerhaeuser. Pramod Gupta developed the first cloning lab for Weyerhaeuser, built a scientific team, consulted with forest managers world-wide, studied optimal growing conditions, presented scientific papers, and earned multiple patents.